Spread some festive cheer—on your favourite crackers! 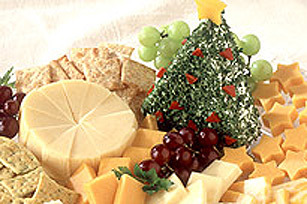 Turn cream cheese into an edible decoration for your holiday cheese platter. This is sure to be the appetizer of the season. CUT 1 pkg. (250g) Philadelphia Cream Cheese on a diagonal. PLACE the outer edges together to form a traingle. SPRINKLE with chopped fresh parsley. Decorate with pieces of red pepper. SERVE at room temperature with Christie Wheat Thins or Vegetable Thins Crackers.